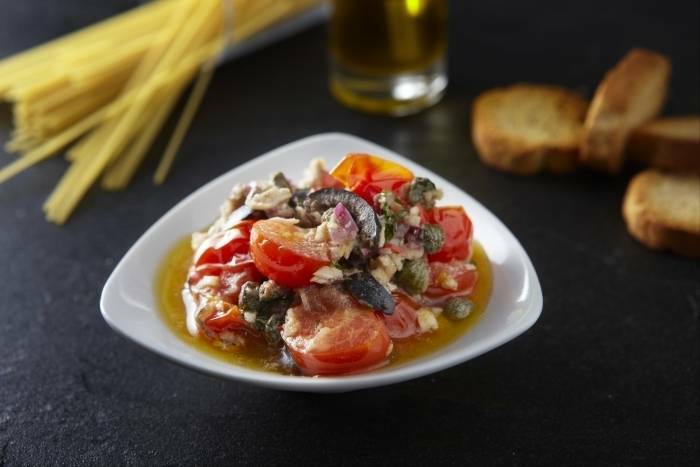 A delicious pasta sauce made with anchovies, capers, black olives, cherry tomatoes and red chilli. To prepare: Drain and finely chop the anchovies. Quarter/roughly chop the black olives. Drain and rinse the capers. Cut the chili in half, de-seed and then finely slice. Peel and finely chop the red onion. Peel and finely chop the garlic. Shred the basil leaves. Chop the cherry tomatoes in half. Heat the olive oil in a large saucepan and then add the garlic, onion, chili and anchovies. Fry for 1-2 minutes and then add the capers, olives and tomatoes. Stir over a high heat until the tomatoes have softened. Check the seasoning (the anchovies, capers and olives are all quite salty so you probably won't need to add any extra). Add the basil, mix well and then stir into the pasta of your choice. Finish with some fresh parmesan shavings.